Today has been a truly beautiful day, sunshine all the way. So this had to be the start of the big garden tidy. After a winter of extremely wet conditions we can finally get to work. 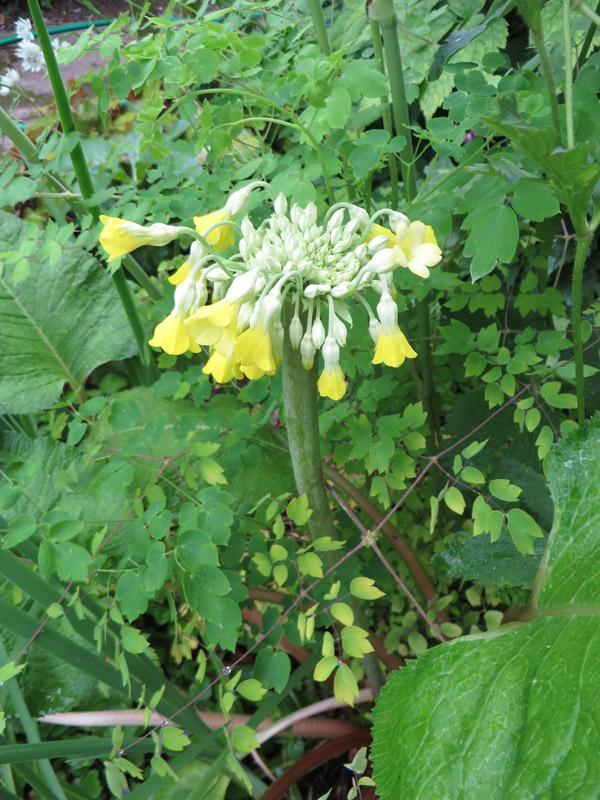 A sad site greeted us, my favorite Auricula ladder had all but died. 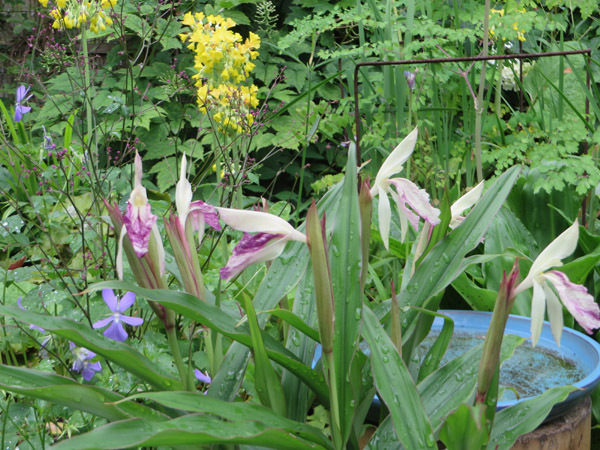 Luckily I had removed the pots during the winter to save them from cracking with frost. The ladder however had taken a turn for the worse. I know it wasn’t going to last long being outside in all weathers but it was still sad all the same.This ladder was given to me by my lovely son in law, a rescue from a University skip. The legs had crumbled and some of the steps had started to come away from the side supports, so there was only one thing for it. The legs have been shortened and is now wired to the fence down the garden where Clematis Alba Luxurians and two roses will keep it company. But… I now need another wooden ladder to replace it !!! 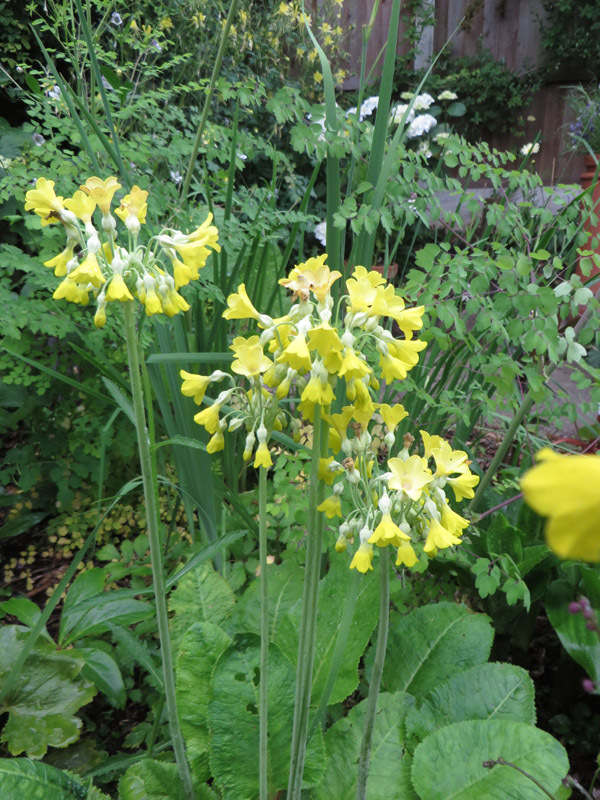 I do have another being used for Auricula that was Mr Malc’s grandfather’s but it is too big for this space. As for the big tidy up this was started on Sunday, the garden waste bins are full the borders are looking better. All ready for feeding and mulching…that can wait for another day. 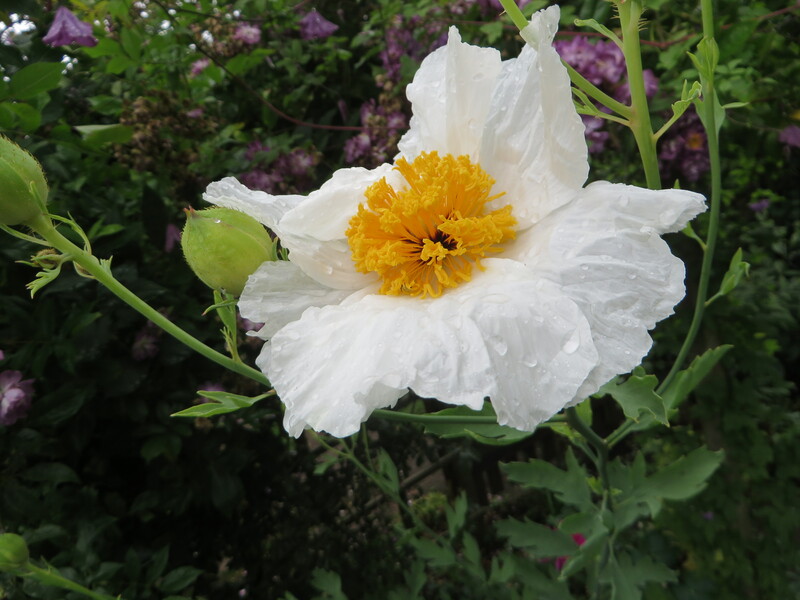 On Friday I took a final walk around the garden for October 2014. 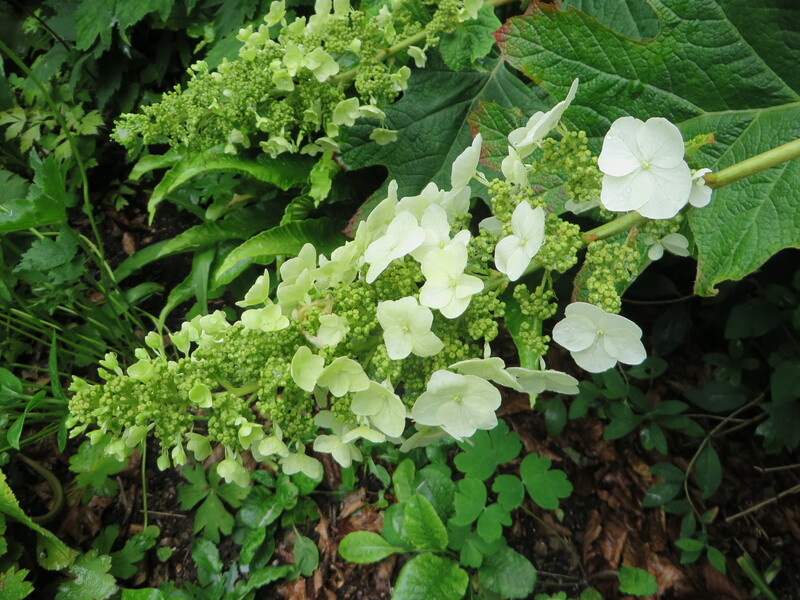 I was pleasantly surprised to find several plants flowering out of season. 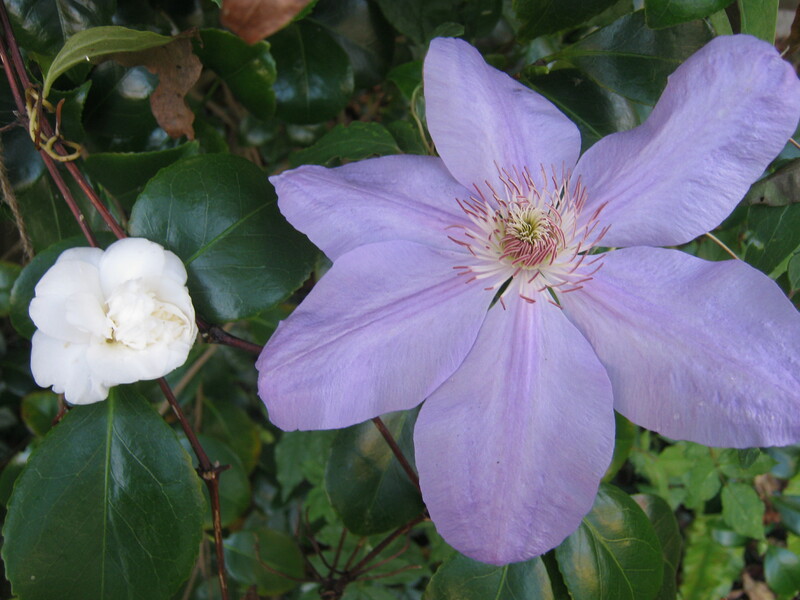 Now both of these blooms just shouldn’t be doing this, Camellia Nobilissima and a large flowered clematis in October ! The camellia usually flowers, if I’m lucky, around Christmas time provided the frost doesn’t get it first. 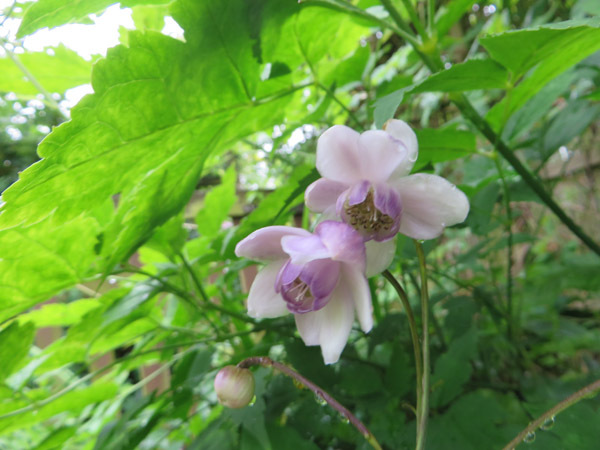 The clematis, well that’s an early summer flowering type. 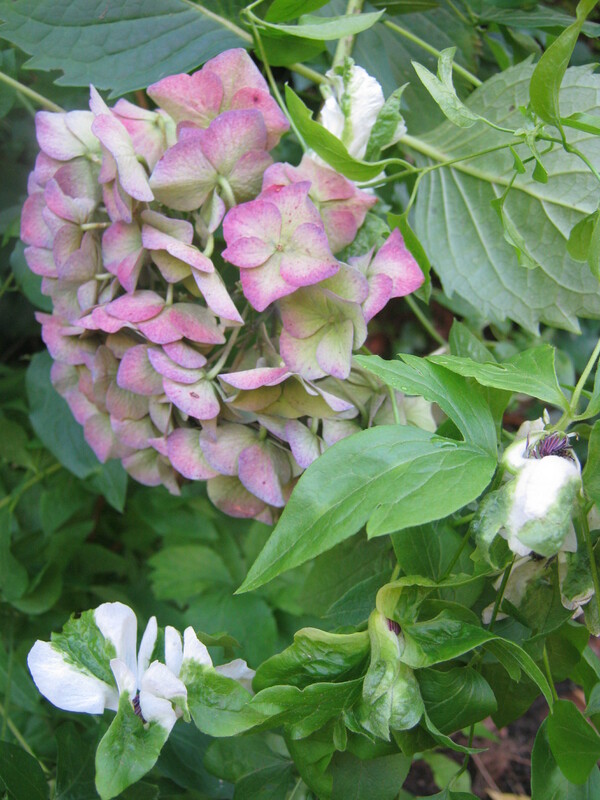 The drying heads of Hydrangea and Clematis Alba Luxurians. 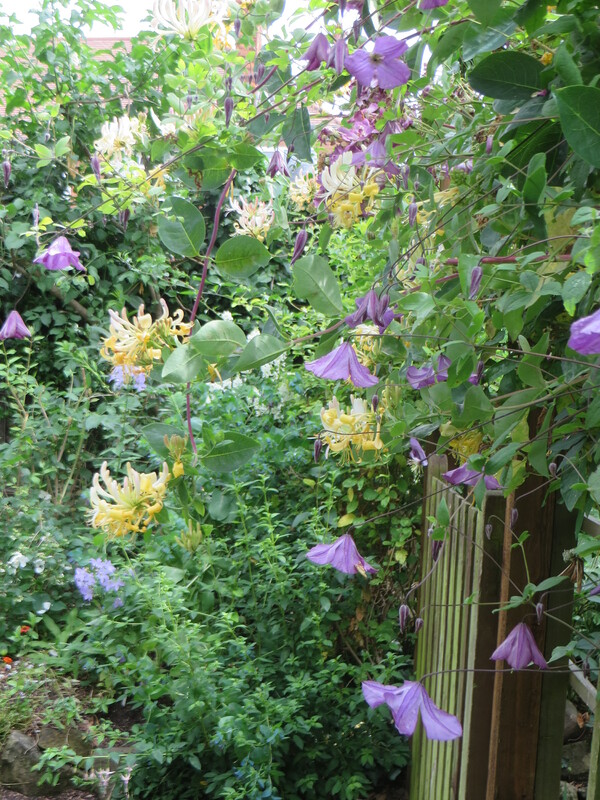 Now I did cut the clematis down at the end of it’s usual flowering time, but it just seems to be going on and on. 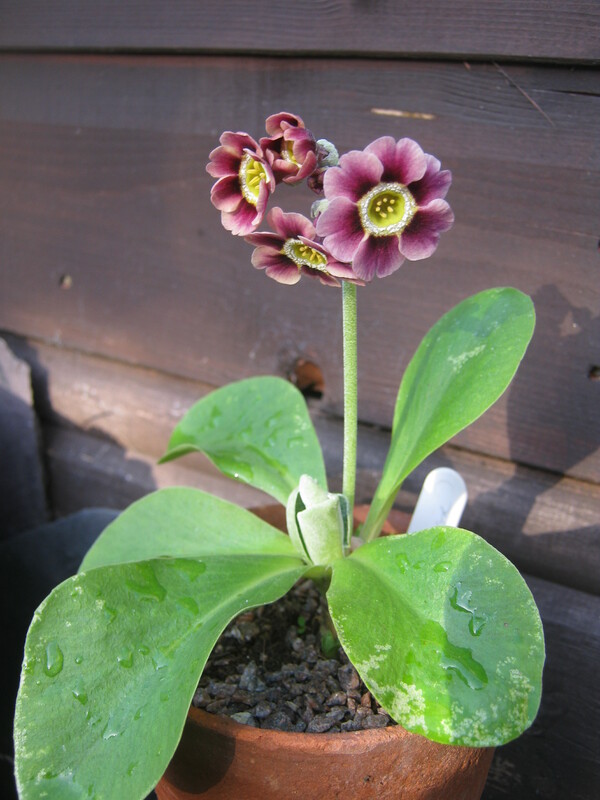 And my favourite an unnamed Auricula looking perfect in the autumn sun. 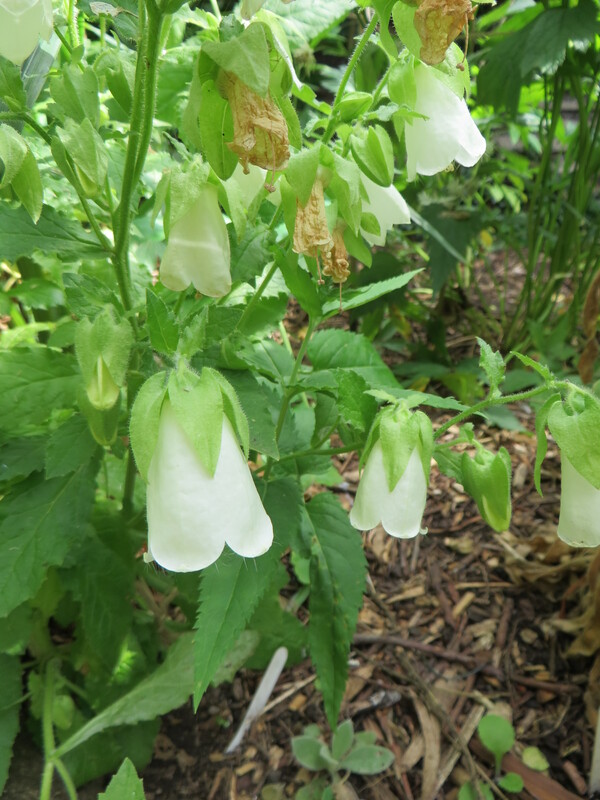 There are several more pots with buds showing. 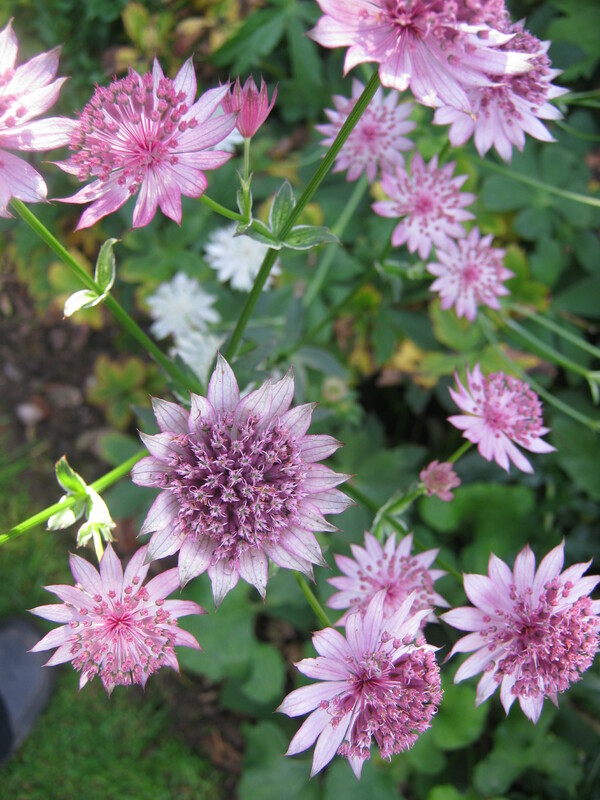 Now all of the Astrantia seem to be enjoying this weather as well. Roma along with Shaggy Florence and Venice are all giving me cut flowers. 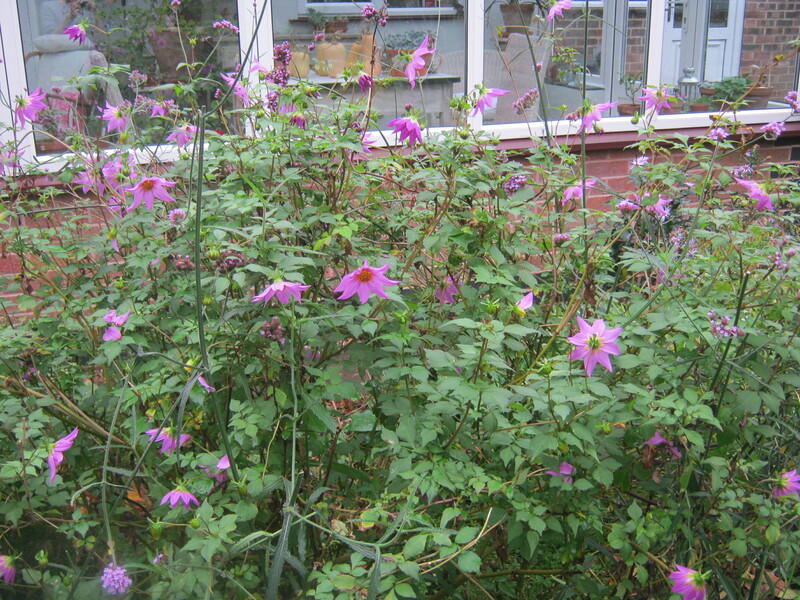 The Dahlia Purpusii has made an enormous amount of growth this year. During the spring I took more cuttings and have four more plants growing, all equally as prolific. 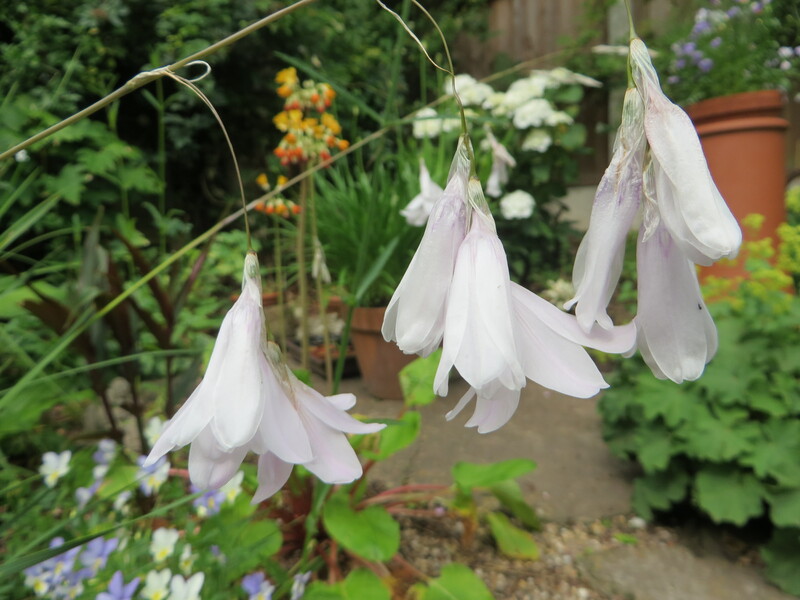 The only thing to do is enjoy the display while you can, it surely can’t last for too much longer……. Yesterday I spend several hours pruning the climbing rose Iceburg. This is growing on a fence between us and our lovely neighbours. 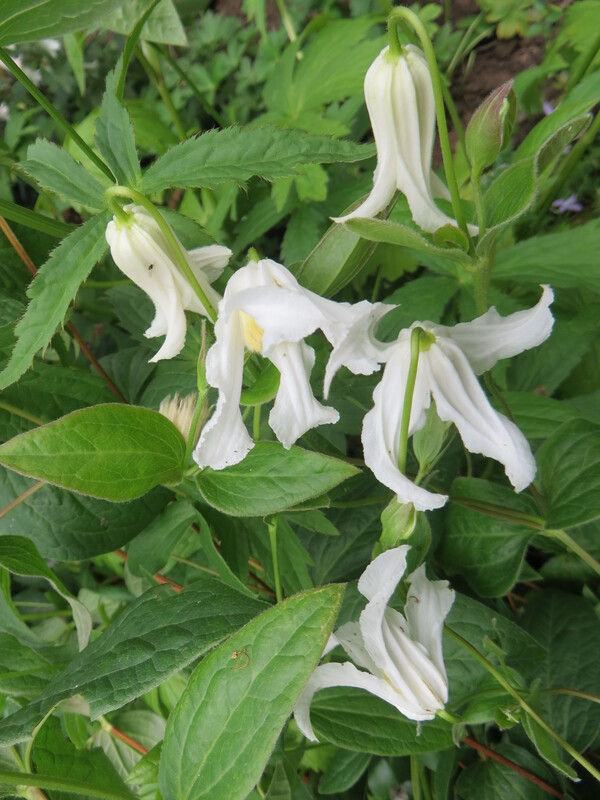 Amongst this are growing several clematis and all but one I could safely cut down, the last is a spring macropetala which has stopped me in my tracks. I now need to wait until the remaining bits of the rose have lost their leaves and a Virginia creeper has given me it’s lovely colour. 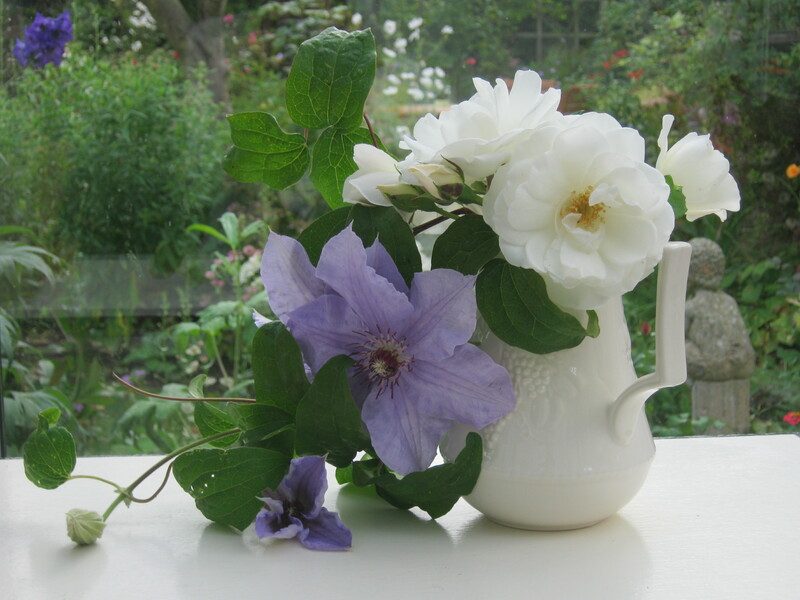 So at the end of the day I was left with some lovely roses and a piece of clematis that was having it’s last growth spurt of the year. So this is my Vase on Monday….thank you Cathy from Rambling in the Garden for hosting this theme.